The Efficacy of Injection of 0.25 mg/kg Dexamethasone after Induction of Anesthesia on Reducing Tonsillectomy Morbidities. 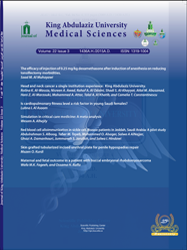 Is Cardiopulmonary Fitness Level a Risk Factor in Young Saudi Females? Red Blood Cell Alloimmunization in Sickle Cell Disease Patients in Jeddah, Saudi Arabia: A Pilot Study.